We all know monsters aren't real. Or ... are they? As it turns out, many of our spookiest monsters and fiercest mythological creatures may have their origins in human encounters with real (and not-so-scary) animals. Behold the fascinating, frightening and fun places where the natural and the unnatural collide. Beneath the dark and churning sea, lurking in the deepest, most impenetrable waters, a giant monster called the Kraken awaits ... or so the legend goes. Myths from around the globe, some dating as far back as 2,000 years, tell of a terrifying, tentacled beast capable of tearing a sailing vessel in half. Many believe the legend of the Kraken came from sailors' encounters with the giant squid - an animal so elusive, it's rarely ever been photographed in the wild, let alone thoroughly researched by scientists. At more than 30 feet long and weighing more than 400 pounds, giant squid can grow large enough to tackle a sperm whale, so it's understandable why they'd come across as intimidating. However, the fact that they're so hard to spot suggests that they're shy animals that keep to themselves and have no desire to interact with humans - hardly a creature to fear! The "river children" of Japanese folklore, Kappas are scaly, flesh-eating aquatic creatures who drag unsuspecting people and animals to a watery grave - though they might just spare you, if you have good manners. Kappas are said to be the size of an adolescent human - which can also be said of the Japanese giant salamander, the animal most often attributed to the origin of the Kappa. Giant salamanders can grow to five feet in length and weigh 55 pounds, and they live in the same habitat as Kappas (between the shore and the shallows) - which means they could certainly surprise an unexpected traveler. Though they don't attack humans, it's still a good idea to keep a polite distance if you ever come across one. Good manners always count! Half eagle and half lion, with razor-sharp claws, beak and talons, the legendary griffin combines the might of two fierce predators. Griffin myths date back to ancient Egyptian times, and the regal beasts were imagined as both fearsome guards of precious treasure and kingly symbols of wisdom and power. In a fascinating twist, folklore historian Adrienne Mayor has theorized that the idea of the griffin was born out of ancient gold miners discovering the fossils of a dinosaur called the protoceratops, which had four legs and a mighty beak. When trying to make sense of the strange skeleton, which seemed to be guarding the precious metal they were mining, an animal resembling a griffin might easily have come to their minds. A giant of the ancient world, the Cyclops was described as a towering monster with a single, great eye in the middle of its big face. Often depicted with vicious, oversized fangs and stubby, hoof-like feet, they were the perfect antagonists for a host of Hellenic heroes. Amazingly enough, this savage giant could actually have been a relative of the elephant! 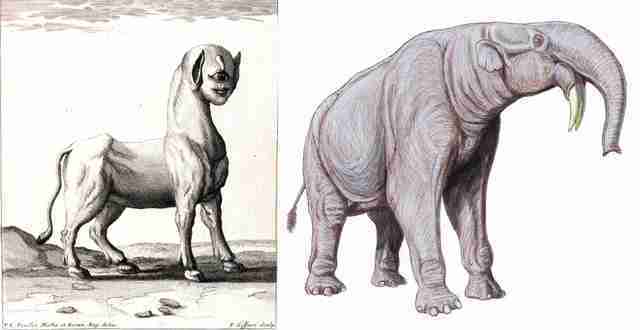 In the Greek isle of Crete, archeologists recently discovered the remains of Deinotherium Giganteum, an extinct "cousin" of the modern pachyderm. Imagine if you had never seen or heard of an elephant before, and you came across a skull with a huge hole right in the middle (where the trunk would be) - it would have been easy to mistake it for the head of a one-eyed giant. Consider a terrifying creature with a strong, scaly body, the jaws of a vicious dog and an insatiable vampiric thirst for the blood of livestock (and possibly small children), and you might come close to the terror of the Chupacabra, one of our more modern monsters. 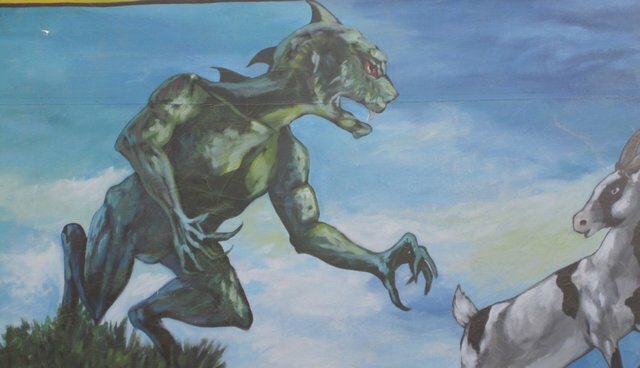 Reported sightings of the Chupacabra started cropping up in Puerto Rico in the 1990s. Since then, however, scientists have explained away most alleged Chupacabra encounters as coyotes suffering from the infectious, unfortunate and debilitating skin disease mange - which would account for both Chupacabra's scaly appearance and predation on livestock. Dragons - humongous and beautiful lizards with giant jaws, sharp claws and mighty magical powers - have flown into the myths of dozens of cultures around the world. Sometimes they take the form of terrifying fire-breathing winged monsters ravaging villages, other times as water-loving symbols of good fortune and fertility, and so on. Historians and anthropologists have long debated the origin of dragon myths, speculating they could be based on anything from encounters with now-extinct giant crocodiles to the discovery of fossilized stegosaurus bones in ancient China to an amalgamation of our primate ancestors' greatest predators. Another possibility is the Komodo dragon, a large, venomous predatory lizard native to Indonesia. An endangered species, Komodo dragons avoid humans whenever possible. In fact, humans pose a greater threat to the Komodo dragons (sometimes poisoning the dragons to protect livestock, along with threatening their habitats with development) than they do to us. In mythology, these dangerous femme fatales lured sailors to shipwreck and certain death for any who couldn't resist their tempting calls. Sometimes depicted as mermaids with the tail of a fish and the body of a beautiful woman, the siren was both a haunting and thrilling monster in seafaring legends. In reality, some anthropologists believe sirens were inspired by dugongs, a large sea mammal with a fluted tail (and a close cousin of the manatee and the elephant). Like their animal relatives, dugongs are peaceful, plant-eating creatures. But since they live close to shore, approaching them too closely could risk a ship running aground or hitting dangerous rocks, possibly inspiring their legends. In the murky waters of Scotland's Loch Ness is said to lie the tremendous and terrible Nessie, the fearsome monster of the Highlands (who just so happens to be very good for tourism). Theories abound on her origin and physiology, from strange mutation to living fossil, and thousands have claimed they've seen her since the most famous sighting more than 80 years ago. Unlike some other mythological monsters, which have potential animal counterparts that may have inspired them, Nessie's counterpart was probably just a few sticks floating on the water at an odd angle. But what made those sticks so compelling as a monster was their resemblance to the plesiosaur, a long-necked water-dwelling dinosaur that became the popular theory to explain Nessie's existence in the 1970s. Alas, the theory has since been debunked - but it's definitely appealing to imagine that one of these mighty ancient lizards might have escaped extinction in the safety of a Scottish lake.